I still remember waiting for a link to open in my mobile when I was using 2G internet service during my college days in Chennai. With the introduction of 3G technology, now, surfing websites on smartphones is possible in a matter of time. Now, I am providing here with a comprehensive list of 3G plans/packages provided by various mobile networks in Chennai. More or less the same pattern of charging exists in all major cities including Mumbai, Delhi and Kolkata with slight difference in prices and usage limits. Which is the best 3G network in Chennai? Most of the smartphone users would have queried this question either in person or online once they decide to opt for a network primarily to use 3G data. The probable answer for this hypothetical question is that it depends on the primary need of the individual concern and the network strength in the place where he resides. So, before choosing the network, change your smartphone/mobile network setting to 3G and check which network has strong signal in your area of residence or office. Aircel offers 3G plans which are comparatively cheaper than Airtel, Vodafone and BSNL. BSNL is a bit costly when it comes to starter plan as they don't provide 1 day validity pack. This chart will be useful to those who wish to activate 3G data just for a day. Here I am providing with the starter plans of Airtel, Aircel, Vodafone and BSNL. Aircel offers the cheap and best starter plan when compared to Airtel, Vodafone and BSNL. But, the problem with Aircel is that the strength of signal is not strong everywhere. It is also said that the data transfer speed is relatively low when compared to Airtel and Vodafone. Minimum validity 3G packs in Chennai – Which is best? Minimum validity in this context refers to any plan with minimum validity of 7 days. This comparison chart will be useful to those who are out for a week in Chennai or to those who need internet facility just to prepare for an examination in the weekend. Aircel is the cheapest, just like the starter plans in minimum validity packs too. 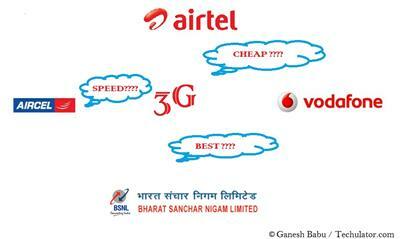 BSNL though it seems to be costly with the price, is second best when compared to Airtel and Vodafone. Network wise there is no comparison to BSNL, however in Chennai data transfer wise Airtel and Vodafone still appear to be best. 1 month validity pack without unlimited data will be useful for those who wish to have 3G facility in their mobiles always and uses them occasional y when there is need or urgency. 1 GB data usage plans will be useful to those who require continuous data usage in their smartphones. If a user requires continuous usage on PC or laptop it is best advised to choose a pack with more than 1 GB usage. Normally 3 to 4 GB will be required if you watch videos and download contents almost regularly. Aircel is cheaper again when it comes to unlimited data plans. BSNL has restricted its unlimited plans to limited plans and so the columns of BSNL are left blank. So, from the above comparisons and personal experience on using these networks, I came to the below mentioned conclusions. Aircel is cheapest of all networks when it comes to pricing of 3G data plans in Chennai. BSNL is best in giving maximum validity for any plan. Airtel and Vodafone are best if transfer rate is the first priority. Please mention higher data plans comparison. Docomo is not in your list, why? Thanks for this good information on inexpensive 3G data plans in Chennai. The comparison of various 3G data plans in Chennai is super. Great work!